Biogenic fluorescence is mainly known from marine organisms, but is rare in terrestrial vertebrates. "So we could hardly believe our eyes when we illuminated the chameleons in our collection with a UV lamp, and almost all species showed blue, previously invisible patterns on the head, some even over the whole body," says David Prötzel, lead author of the new study and Ph.D. student at the Bavarian State Collection of Zoology (ZSM). To understand the phenomenon, the researchers used a variety of modern methods. Micro-CT scans showed that the pattern of fluorescence exactly matched the distribution of tubercles pattern on the skull. The tissue analyses yielded another surprise: "Our histological 3-D reconstruction shows that the skin covering the tubercles on the skull is very thin and consists only of a transparent layer of epidermis,"explains Dr. Martin Heß from the BioCenter of the Ludwig-Maximilians-Universität München. These patches effectively act as windows that enable UV light to reach the bone, where it is absorbed and then emitted again as blue fluorescent light. "It has long been known that bones fluoresce under UV light, but that animals use this phenomenon to fluoresce themselves has surprised us and was previously unknown," says Dr. Frank Glaw, Curator of Herpetology at the Bavarian State Collection of Zoology. The tubercles fluoresce under UV light to form distinct patterns that represent certain species or species groups. In addition, the males in most species of the genus Calumma have significantly more fluorescent tubercles than the females. 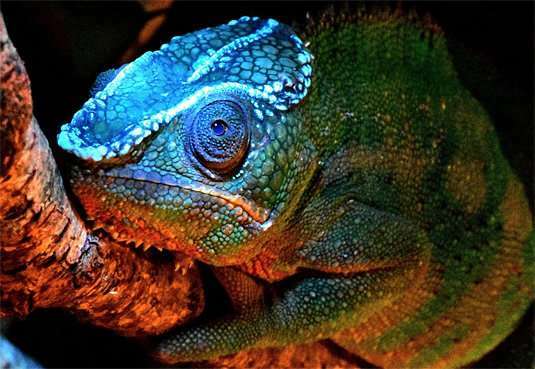 Therefore, the researchers suspect that this fluorescence is not a mere coincidence, but helps the chameleons to recognize conspecifics, and presents a consistent pattern in addition to their skin-based colour language—especially as blue is a rare colour and easily recognisable in the forest.